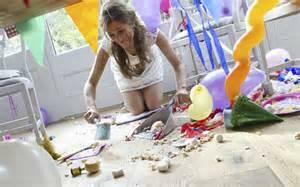 Make sure to start with a nice clean house before the party so that it's not quite as hard to clean up. Have your favorite Maid service come out to clean or hire us (Easy Life House Cleaning). Use disposable cups, plates and utensils. You can find some festive looking colors. Put your waste baskets and large trash cans where guests can find them. You'll want to keep them enptied when they fill up. Lastly, send all the leftovers home with the guests. Buy enough extra foil or disposable containers to use for that.